IMSI-Strict combines Tygerberg Strict Criteria with motile sperm organelle morphology examination (MSOME) and provides software-based categorization using head size, head shape, mid-piece, and number of vacuoles. Using these analyzed parameters, sperm are assigned to one of three categories – normal, sub-normal or abnormal. IMSI stands for Intracytoplasmic Morphologically Selected Sperm Injection. Using high magnification light microscopy on a live, motile sperm sample, the most morphologically normal sperm is selected from the sperm population and then used for intracytoplasmic sperm injection (ICSI). The goal of IMSI is to select the “best sperm” to be injected into the egg with the thought that this sperm will have the highest possibility of success in IVF. The IMSI method is based on motile sperm organellar morphology examination (MSOME). 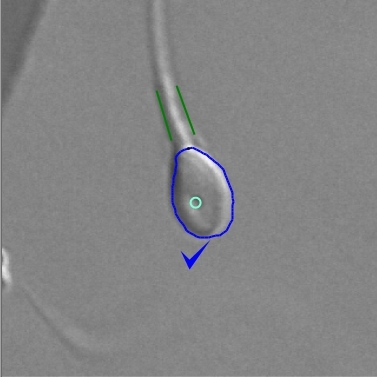 The examination of motile sperm is performed in real time using an inverted light microscope equipped with high-power Nomarski optics enhanced by digital imaging to achieve a magnification in excess of 6000x. This allows the sperm to be examined in greater detail, including the nucleus which contains the sperm’s genetic material. 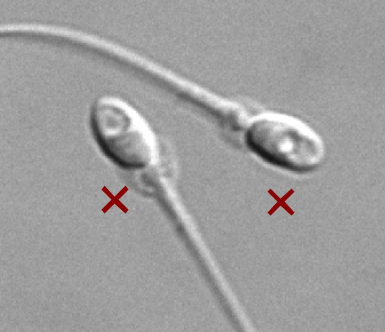 Some studies suggest that using this technique selects better quality sperm and results in higher pregnancy rates and lower miscarriage rates compared to conventional ICSI. 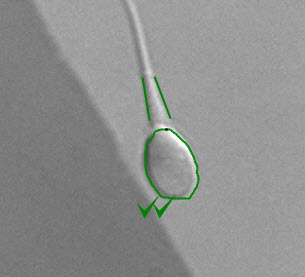 The Hamilton Thorne IMSI-Strict software aids in the IMSI process by measuring the size and shape of the sperm head, detecting midpiece abnormalities and identifying vacuoles on the live sperm sample. The results are displayed in real-time to assist the embryologist in selection of sperm to use for ICSI. 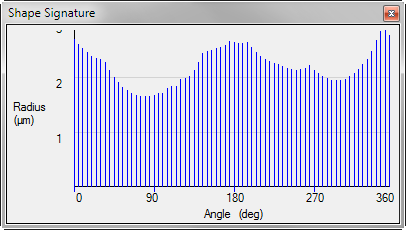 The Hamilton Thorne IMSI-Strict software is unique in combining MSOME and Kruger Strict criteria in one analysis. With IMSI-Strict, there are three methods of analysis from which to choose: 1) perform real-time morphology on the live, motile image, 2) take a snapshot of the live image and then initiate morphology analysis, or 3) record and save a video to use for analysis. 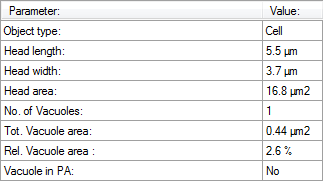 The main analysis controls are accessible from the toolbar, so you do not have to search through menus. This means you can quickly locate the controls, begin analysis and limit the time spent selecting sperm. 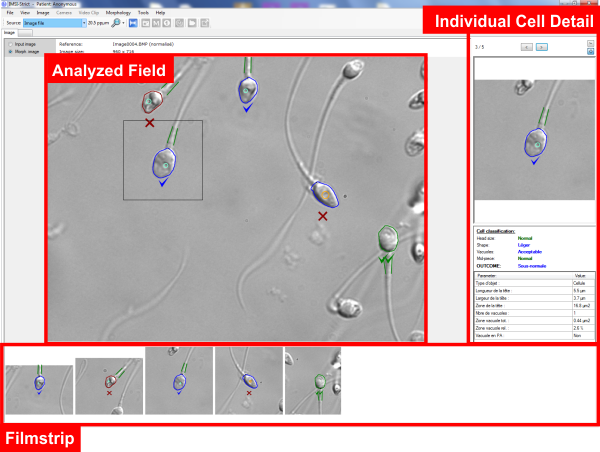 Analyzing in one-touch mode, a snapshot is made of the field, sperm are analyzed, and the image is optionally saved to the patient file. This may also be performed on video samples, as shown below. In real-time mode, the software follows the sperm and assigns categories (normal, sub-normal, abnormal while the sperm is in motion. This may also be performed on video samples, as shown below. The results screen immediately appears following analysis of all cells in the field of view or when Stop Real-time Morphology is selected. 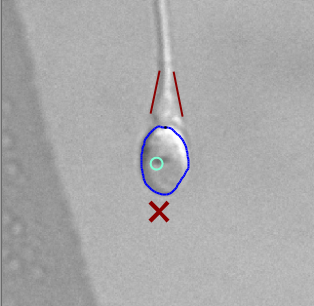 Supplementary information of the shape of the sperm cell head can be viewed by selecting the “tilde” button next to the navigation arrows in the detailed results pane on the right side of the screen. An identified object may be assigned to one of four categories. Vacuole in PA: Yes/No indication if any vacuole is located in post-acrosomal region. 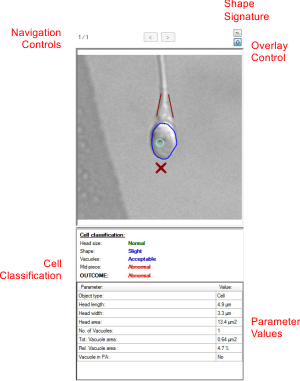 See Classification Parameters for detailed information on how cells are classified. 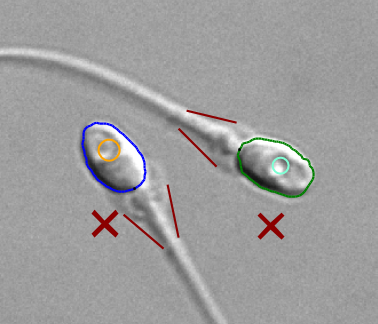 Normal Outcome: A cell with a Normal Outcome, will show two green check marks, plus a green sperm head circumference, green mid piece designators, and no vacuoles. Sub-normal Outcome: A cell with a sub-normal outcome will show one blue check mark. The colors of the overlay and text will be either green or blue. Vacuoles, indicated by circles, will encompass less than 7% of the head area and no vacuoles will be located in the post-acrsome area. Abnormal Outcome: A cell with a abnormal outcome will show one red X. The color of at least one parameter will be red or vacuoles will encompass greater than 7% of the head area or at least one vacuole will be located in the post-acrsome area. Depending on the need of your facility, there are several IMSI-Strict packages from which to choose. Geared towards those who already have an acceptable camera installed on their microscope. Geared towards those who already have an acceptable camera installed on their microscope and have a computer system meeting the minimum requirements. Note 1 – Please note that the camera must be attached to the microscope using a compatible c-mount adapter. This is available from your microscope dealer.